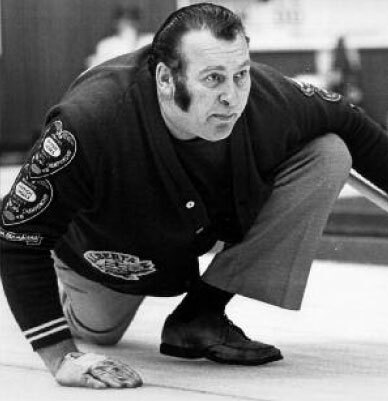 There never was a bigger man who threw a curling stone in anger than Alberta’s Hector Gervais. Through much of his career Gervais — who stood six-foot-four — weighed more than 270 pounds but had the touch of a butterfly when it came to drawing the four-foot. Gervais grew up in St. Albert, just outside of Edmonton, and it was there that he learned to curl and first made his mark on the game. 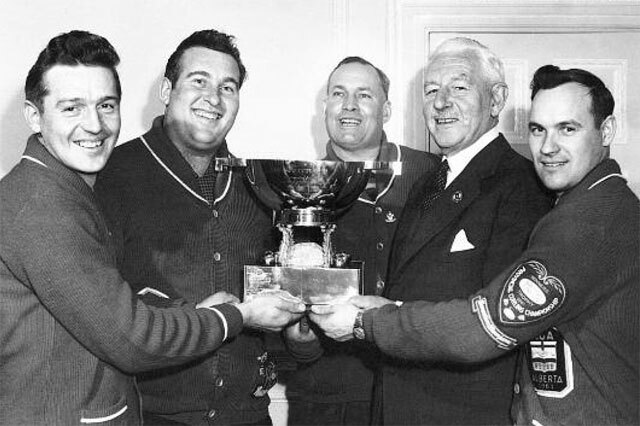 In the late 1950s he won the City of Edmonton bonspiel three years in a row, a feat that caught the attention of Matt Baldwin, who had captured his third Brier title in 1958. Two years later, Baldwin linked up with Gervais and it looked like the combination would be invincible. But invincible it was not; they lost the final of the 1960 Alberta playdowns to Calgary’s Stu Beagle. Nonetheless, Baldwin — who represented Alberta at five Briers — has since claimed that his 1960 team with Gervais at third, Fred Fekete at second and Bill Price at lead was his best ever. Gervais went back to skipping in 1961 with 19-year-old university student Ron Anton at third, Ray Werner at second and Wally Ursuliak at lead. 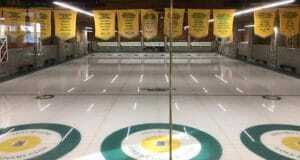 The team swept the Alberta playdowns en route to the Macdonald Brier in Calgary. In the round robin, Gervais lost only one game — 11-7 to Prince Edward Island’s Doug Cameron — finishing with a 9-1 record, a game in front of Saskatchewan’s Jack Keys. A few weeks later, in Scotland, with Vic Raymer filling in for Anton, who was writing exams, Gervais won the Scotch Cup — the world men’s curling championship — keeping Canada’s global winning streak intact at 3-0. 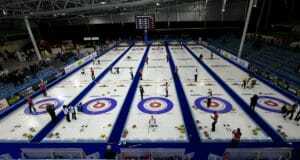 The defending champions made it back to the Brier in 1962 in Kitchener-Waterloo, Ontario. The field was a little tougher this time and at the end of the round robin Gervais was tied with Manitoba’s Norm Houck and Saskatchewan’s Ernie Richardson at 8-2. Richardson drew a bye to the final and Gervais defeated Houck in the tiebreaker. But Richardson was too much for Gervais in the final and the Saskatchewan team won its third Canadian title in four years. Gervais struggled over the next few years but finally made it back to the 1970 Brier in Winnipeg, this time with Bill Mitchell, Wayne Saboe and Bill Tainsh. The victim of tough ice conditions early, the team battled back to a second place 8-2 finish behind the champion, Don Duguid of Manitoba, who finished at 9-1. Gervais failed to reach the provincial final in 1971 and, as a result, joined forces with his old third, Ron Anton, the following year. The combo struggled and many thought the Friendly Giant, as he was known, would never make it back to the Brier. But in 1974 it all came together and Gervais headed for his fourth and final Brier with his team of Anton, Warren Hansen and Darrel Sutton. Going into the last draw of the round robin, Gervais and Saskatchewan’s Larry McGrath were tied for top spot with 7-2 records. Quebec’s Jim Ursel was one game back with a record of 6-3. Gervais squeezed by Ursel 3-2 in the last round, while Ontario’s Paul Savage stopped Saskatchewan, giving Gervais his second Brier title. Unfortunately, Gervais couldn’t keep the momentum going this time at the world championship in Berne, Switzerland, losing the semifinal 8-7 to Sweden’s Jan Ullsten. The curling world was shocked and saddened on July 19, 1997, when, at the age of 63, Gervais suddenly passed away as a result of a heart attack. Gervais left a mark on the sport of curling worldwide that will last forever. Previous: Great Scot… Muirhead’s Coming to the Cup!